Now that I am retired from surgery memories come floating into my head. Incidents that I had forgotten big and small and good and bad. I have been ruminating on one of my patients who was quite an inspiration to me (we will call him E). If the rebirth theory and Nirvana holds true he was close to attaining that state, old soul and all that. It so happened that when I dealt with patients that some of them became my friends. It was understandably those with serious diagnoses. They and their families need so much more from you than simple cases solved quickly. The simple cases mainly need technical excellence and that is that. In some ways I was rationing my “love” because I think my “love” is finite. I know that some teach that the more you give the more you can give but I don´t think so. I have seen so many health professional who have become callous and burnt out with no “love” left to give. Back to my friend and our journey together. In some ways you might say that I have lived through many lives with my patients especially their last years. We sat together drinking coffee and telling each other stories. When my friend was a boy on a farm in South East Iceland one of our national bards Thorbergur was visiting as he was born in that area. Thorbergur was notorious for his angst of ghosts and everybody knew that even little boys. He told his stories quietly with a soft smile and immense presence. He was a tall man powerfully built and with the largest pair of hands I ever have seen. He radiated kindness but he was firm all the same. Previously the nightlife in Reykjavik had become rowdier and wilder. In one incident the bad boys had spilt into the ER and were partying. Knocking over medicinal cabinets and what not. Young Dr. H (one of my closest friends) was dusted a bit and the attending orthopedic surgeon Dr. H* who is built like a classical orthopedic surgeon (a tank) and behaves like one. Not the kind kumbaya type you meet today. He sustained rib fractures so good times were had all around. The countermeasures were to have an officer there during the weekends. Officer E was one of the first to take that shift and when he was there all was calm. The bad boys came and he just met them and genially said “How are you boys” smiled and placed his hand on someone´s shoulder and that was enough. You can radiate power in different ways. I had to do a rather big abdominal operation on him one early spring and he recovered from that eventually. I meet him the next fall. “What have you been up to my friend?” “Well I was not sure if I was alive after all I have been through” he said. “You look alive to me.” “I know and I feel alive now after my experiment.” “Now what did you do” I asked him? “Well as I was in doubt on my vitality I returned to my birthplace. 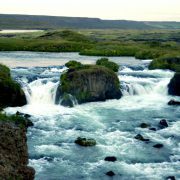 You know there is this glacial river there Jokulsa i Loni?” “I know” I answered “I have seen that river and passed it on the bridge several times.” He says “I know a ford in that river from my youth.” “And” I ask? He goes on and “I picked up a big slab of stone to weigh me down.” Now I became worried “You idiot you could rupture the wound or some such doctor worries.” His answer was “But I needed to know if I was alive.” A verbal touchdown? “Then I proceeded to the ford on the river and made it over to the other bank. The current was fast and cold but the stone kept me down but I became pretty tired though.” And goes on “Now I realized the car was on the opposite site so I had to wade it again.” I am now flabbergasted. He continuous “Then I knew I was alive.” Just like that calmly half smiling and with this gentle and loving presence that I cannot fully describe. I loved this man and will always be grateful that I got to know him. As I write this I think that the smoke from the fireplace has gotten to my eyes and I need to go fix that. *Dr. H is without question my favorite orthopedic surgeon. Both Drs. H are fly fishermen and there is a river there somewhere as this is a fishing blog. “Are you a fly fisherman”? “It is a disease” I retorted. “I will pick you up tomorrow,” he said. “Sure” I answered – “what river are we fishing”? “It is the river Mine” he answers and we were practically engaged. I had in my lapel a small brown trout pin made of tin. Nothing fancy but a statement all the same. “Who is this guy?” I asked after he had disappeared. I was visiting with a leading surgical instruments maker in the New England area and being chaperoned around by a sales rep. I noticed that everyone around us had gotten quiet and very respectful. The rep looked at me and said, “this is Mr. X and he owns this place”. So next morning a car is in front of my hotel to pick me up. I have gone fishing in all kinds of vehicles but never before or since have I gone in a stretch limo. SUVs small and large even Skodas but never a limo. I say that is just a great way to travel. We drive out into the countryside for a bit and come to a great estate that is walled in. When inside it was just a beautiful land with some bass ponds here and there and a hill. The river Mine was so constructed that water was pumped to the top of the hill and then it came flowing down through pools and meandering curves when it was being fished otherwise it was just a trickle. Trees and brushes were on the banks and the pools were so constructed that you could cast in the correct direction and the back cast was unobstructed. It was a like a Japanese garden – serene and peaceful. Of course the fishing was fabulous – rainbows and browns galore. Later he came to Iceland on his private jet and I served as his ghillie salmon fishing. Now salmon fishing can both be crushingly boring and fabulously exciting. The way it works in Iceland is that you buy a fishing permit for one rod for 3 days for instance. Each river has only a certain number of rods each day that are allowed to fish it depending on the annual catch. Some rivers have just 2 rods per day other have more also depending also on the length of the river. The salmon are a migratory fish and if they are “late” or you are “early” it is boring I tell you. If the salmon are running up the river and you are there it is magical but then there is the weather. Iceland is in the subarctic zone. The Arctic Circle is just north of Iceland and traverses Grimsey (small island off the coast of Iceland). Any day of the year at those latitudes can bring a blizzard or a howling northerly or both. 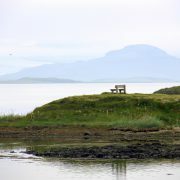 We do have a month called July in Iceland but it is a far cry from an USA July. So of course we have 3 days of howling north wind at our river when we were supposed to be fishing, with temperature around 40F. Mr. X was not expecting this weather and was a bit underdressed for it. All the same we were flogging the river and shivering. Now in Iceland we have a curious custom when we get cold. We slap our palms on our torsos for a bit and presto we get warmer. This custom was totally alien to the billionaire so I gave him a good hiding with my palms. He suddenly got furious but then suddenly he smiled and said “You are the only one who has beaten me in a long while – and I liked it”! – When fishing a considerable time is spent on the banks just shooting the breeze and having a little dram of whiskey every now and then. I was on a roll telling stories (I can b.s. with the best of them) and explaining the geology and what not when he wrapped up the pause by saying “Jonas – you are full of useless information”. I would say that this is the best backhanded compliment I have ever gotten.